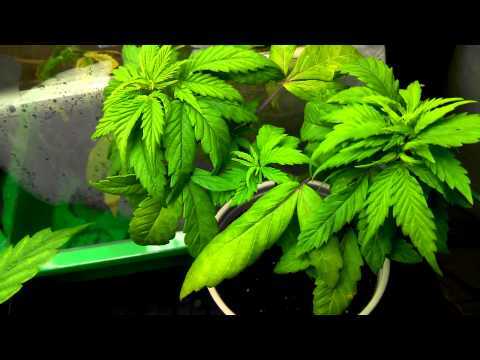 So you’ve successfully got your marijuana seedlings growing, and they’re becoming more and more bountiful and bushy, and you’re wondering when the best time is to top your plant. This technique is referred to in a variety of ways. From “cropping” or “pruning” to “topping”. The most important thing to keep in mind is that your plant will need to have it’s root system well established. For this reason, I’d generally try to to wait at least a month from germination. Or an even better idea is to simply wait until your plant is big enough. The third node ( nodes are sets of branches that you see growing out from the main stem ) is generally a good indicator that your plant is ready to be topped ) two nodes being the minimum). Now, in the video below you’ll see that he’s got some plants which are longer than others, and the main thing to keep in mind when you’re plants are in veg is that the light needs to be really close. The closer your lights, the closer together your nodes will be. Marijuana plants stretch when they’re looking for light. If they have plenty they’ll stay short and compact, which will increase harvest and prevent stems from breaking and falling over. Basically, they’re just easier to manage. SO once you’ve got some good growth of at least two to three nodes, you can crop. There are a few ways of doing this. And I’ll provide the videos to all these techniques below. When to top your plant. Previous New Species of Marijuana Discovered in Australia! Next How much soil does 1 marijuana plant need?